Since 1995 Synchronic Presentations has been my "company" / publisher name for various releases: movies, music, comic books and computer games. I started programming with GW-Basic 3.22 in 1991. 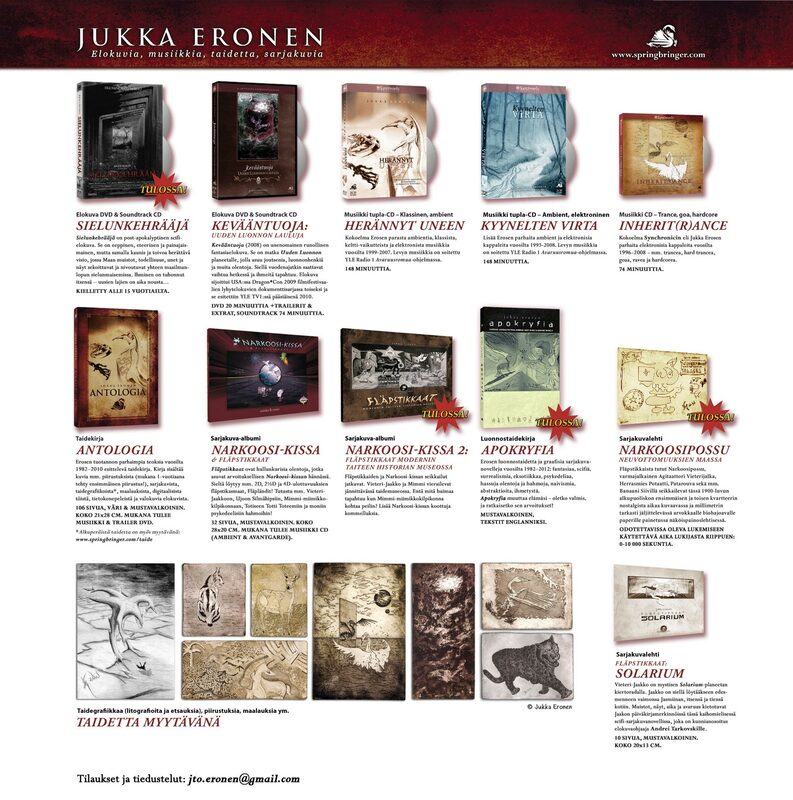 Pretty soon I started to use Jukka Eronen Productions as a publisher name. I briefly tried QBasic for a while. In 1993 I found Turbo Pascal. I've coded of countless hours with it and even today it's the programming language I know and do the best. Here are some screenshots of game concepts I've created since 1992. Unfortunately most them were unfinished. I've always prefered making graphics and music so that was probably part of the reason they didn't get finished. But my dream has always been to make a 1980s or early 1990s type of game. Some day I finally hope to finish one of these or some other retro game. Check out the blog for coming updates. Springbringer (2002–) - Adventure / puzzle. Here's a first post in a series of articles about unfinished/unreleased games and their artwork; both by big game companies and independent stuff, such as my own retro games by Synchronic Presentations. A forever pet project of mine, the Springbringer saga started in around 2002 both as designs for a classic-style adventure game with a working title Eve Santon and as comic book illustrations. 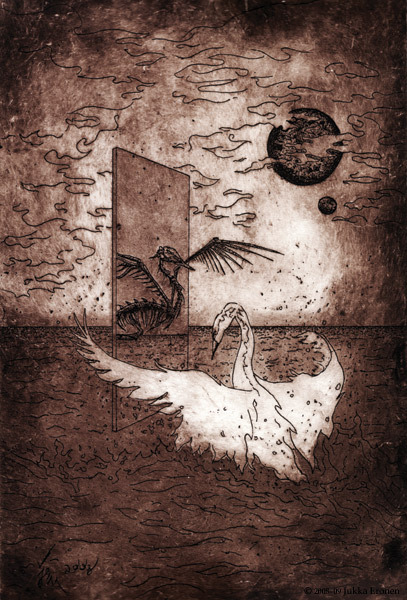 The events of Springbringer take place in a fantasy world of New Nature, a planet of three moons, where swans, dragons, deer, other mystical animals, beings and spirits of nature live. New Nature is a world full of wonders and a poetic place where seasons can change unexpectedly. The game ideas, illustrations and comic book ideas merged while developing the world. These pictures and game concept arts are mainly from 2002–2008 with some revisits from 2015. The menu screen utilizes a scan of an oil painting from 2007 called Springbringer: Moon of the Spring (56x69 cm). Story setting: "Three thousand suns ago... A seed falls from the sky. It lands on the bottom of a pond. Something beatiful starts to happen. The seed begins to sprout. It rises and breaks the water surface. A Sprite is born. Swans gather around the Sprite calling them. The pond starts to effervesce. The Moon shines overhead and sees it all. The Sprite sends the swans on a voyage to the Moon. They must fly there before the sky freezes over..."
The development of my fantasy worlds often begin with a singular picture, scene or a concept. The picture above is 2015 version of a 2002 picture of the high castle of Eve Santon. I made and edited it from a photo my grandmother took in the Canary Islands in the 1970s. In this 2015 version a mist dragon is approaching "the castle on top of the world". In the original 2002 version two giant cloud birds flew in the sky approaching the castle. 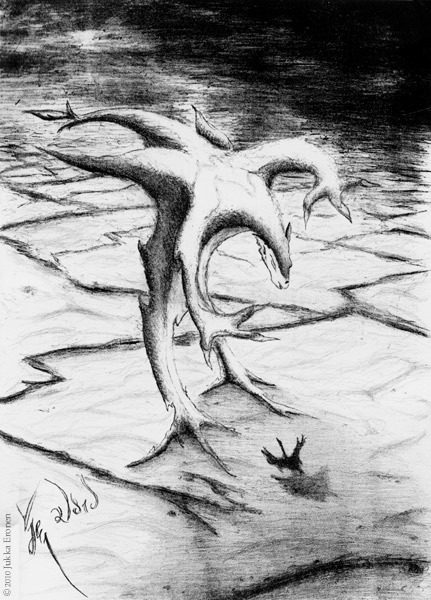 That version was used as cover for an ambient/trance/electronic CD album Choices for the New Nature: The Wish of Being the Guardian of Life (Synchronic, 2002). There is also medieval music based on this scene and other pieces (MP3s are upcoming to the Music-section). Sprite animations of the white and gray swan (2002). Rentauxs – the dragon of black fire, Fire Dragon, black swan, ash swan, gray swan and the Sprite of Spring. Here above are some sample pages from the old version of the comic book under development from 2002–2009. A new version of the Springbringer comic book (graphic novel) and illustrations are still planned. They are in a different style – more lively and sketch-like. Fine art in the form of etchings and lithographs has also been made (enquire originals or prints – here and here are more pictures). 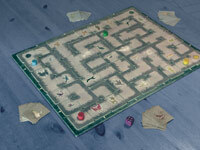 There was also a board game made for fun called Springbringer: Labyrinth of Thoughts (2008) – with one copy made. Tight Spot (1995–96, unfinished) - Puzzle/platform game. The main characters Bum and Pow (a bomb and a dynamite) of this unfinished game are my oldest comic book characters still in use, from 1991. They are part of the Narcosis the Cat Meets the Flapsticks -comic book world. This was one of my pet projects and I still hope to do something with the concept some day. The title screen was my first oil painting. My grandmother taught me to paint with oils in the 90s. Knights over Europe (1993, unfinished) - Point 'n click adventure game. Inspired by Sierra adventures. There were lots of music and screenshots made and some code with Turbo Pascal. Flog over Europe (1995, unfinished) - Animated golf game. This was inspired by the funnily animated Wacky World of Miniature Golf CD-i game. The Right Poker (1994, unfinished) - Card game. This game was originally supposed to be some kind of a special battleship type of game (see the board and sprites on screen 3). But the idea was changed to more easily executable tic-tac-toe with characters to choose from. The plot was about annual "eastern" tic-tac-toe-championships ;) (with the eastern theme possibly inspired by Tetris and Big Red Adventure of the time). Quak (199?) - Duck game. Rubber ducks were popular in the 90s. This animation and theme music was made but this quacking game didn't advance much more. Shadow Chess (2006, pixel art) - A chess game. Illustrations and sprites for a fictional chess game. Rukki Guards (1993) - Projectile-avoiding game. See this article at its own page. 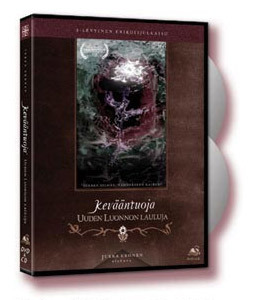 1992 (Jukka Eronen Productions) to this day (Synchronic presentations).